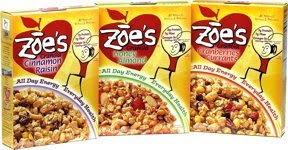 Sign up for the Zoe Foods Consumer Advisory Panel, and receive a free box of Zoe's Granola. As a member of the advisory panel, you will be asked from time to time to give feedback on products, and they will give you coupons for their products as a reward. I looked at their store locater, and there are no stores around my area that carry their products, so I guess I won't be participating in any surverys since the coupons won't do me much good. But I will be happy to receive the free box of granola anyway!